The Sixty Best Episodes of XENA: WARRIOR PRINCESS (51-55) | THAT'S ENTERTAINMENT! Welcome to another Xena Thursday post! We’re continuing with my 60 favorite episodes of Xena: Warrior Princess. I’ve been a fan of this series since I was about three years old and believe me–this list was tough to make! If you’re unfamiliar with the show, it was a spin-off of Hercules: The Legendary Journeys and aired in first-run syndication from 1995 to 2001. Taking place primarily in Ancient Greece, the show focused on Xena (Lucy Lawless), a reformed warlord seeking redemption for her evil past by helping others. She traveled with her best friend, Gabrielle (Renée O’Connor), an aspiring bard and the chronicler of Xena’s adventures. With all that said, let us resume with episodes 51-55 on the list. Veteran fans may be surprised to see this dramatic, well-produced, important episode relatively low on my list of the 60 best. 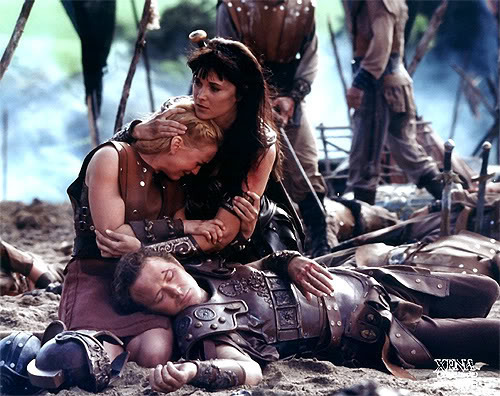 Like Steve Sears’s earlier classics, “The Deliverer” and “When In Rome…” (to be discussed on upcoming Thursdays), which both dealt with Xena’s lingering hatred towards Julius Caesar and Gabrielle’s personal struggles with violence, “A Good Day” continues both threads and weaves them into an episode that ran about 20 minutes too long in its initial cut. There’s so much story here that the 44-minute time limit is a hinderance. What separates this episode from the other two, in particular, is the overwhelming sense of tragedy that lingers throughout the episode – from the moment we meet the villagers to the moment when Gabrielle grieves for the fallen soldier. Yet, while those two earlier episodes were more suspenseful and will appear higher on my list, this episode still has a lot to offer. Chief of which is (SPOILER ALERT) : Gabrielle’s inability to kill the man who killed her friend. She knows how to throw a spear… so did she miss on purpose? A jealous Aphrodite casts a hex on Gabrielle’s scroll, which causes everything she writes to come true. Of course, what Gabrielle writes isn’t always precisely what she means. A comedy! A Xena-lite episode that was produced while Lucy was finishing up her stint on Broadway in Grease, this hilarious romp includes many fan-favorites: Joxer, Ares, Aphrodite, and one of the series’s funniest recurring characters, Minya, the country bumpkin who desperately longs to be like Xena. Silly as hell, this episode features many standout moments, so I’ll list a couple: Joxer’s poem and the three naked Gabrielle’s, Aphrodite’s stench, and Joxer and Minya’s kiss. In a season filled with tragedy and betrayal, the lighter episodes became extremely farcical to balance the weight of the darker episodes. As a result, the comedies got crazier and crazier. Season Three was Xena at it’s zenith (ha!) and both the comedic episodes and dramatic episodes are probably the best of the bunch. This is an incredibly fun episode, no doubt, and the interaction amongst this particular group of characters is stellar, but because Xena is only in the teaser and last two acts, I’d recommend that new fans choose a different comedy to start with. For me, personally, the series really CLICKED for the first time during the last five episodes of Season One. These last five episodes, starting with this one, are so character-specific and well produced that the series is, by now, telling much better stories than its parent/brother show, Hercules. This is the second episode to feature Xena’s former mentor, Ares, the God of War. Also, this is the first episode to address questions regarding Xena’s father. 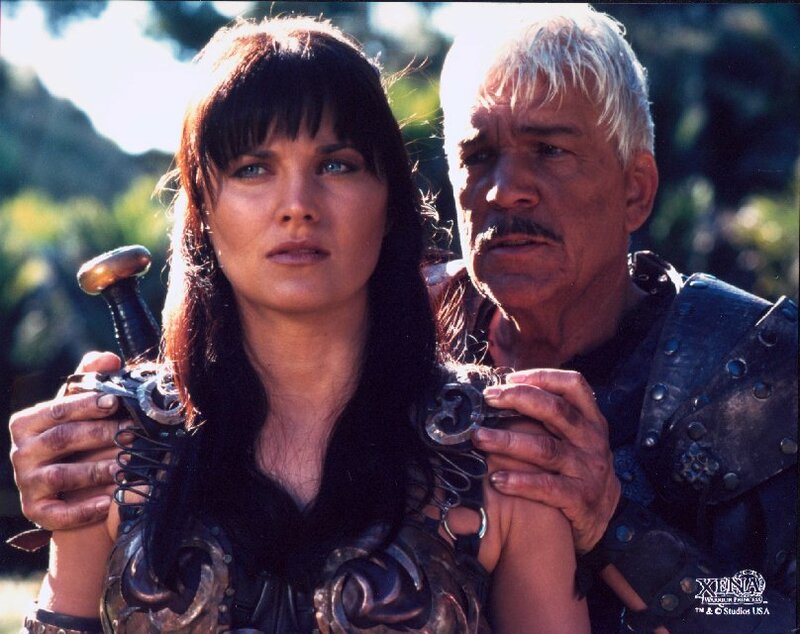 This actually was intended to be a major part of the series, as the pilot was initially to end with Xena going out to search for her estranged father. That plot was abandoned, but the important issue was not. I have to tread lightly because I don’t want to spoil anything, but the issue of Xena’s father’s desertion will return later in a BIG WAY during the Season Three premiere. My favorite moments from this episode include Xena’s spine-chilling moment at the end of the third act, and the quiet scene between Xena and Gabrielle, early in the episode, where Xena discusses the one memory she has of her father. Even the warlord Draco becomes a comedic victim of Cupid’s son, Bliss, when the mischievous boy creates unlikely romantic pairings among Xena, Gabrielle, Joxer and Draco. Another comedy! This is a fun episode and brings back Draco, the fascinating villain that we first met way back in the pilot. This is the second of his three appearances, and he always makes for an interesting character. He’s dangerous, menacing, conniving, and yet principled. The plot is simple: Cupid’s son escapes and shoots up the city with his love arrows. Meanwhile, Xena, Gabrielle, and Joxer are trying to stop Draco from selling the Hestian Virgins to slavery. Things get complicated when Xena falls for Draco, Gabrielle falls for Joxer (who already likes her), and Draco falls for Gabrielle! An enjoyable episode from Xena‘s highest rated season, you’ll notice that this comedy is silly, but not quite as zany as the comedic episodes would become the following season, when the show’s growing darkness would necessitate larger swings in tone. Two of my favorite moments here include Xena’s use of the punching bag to vent her sexual frustrations and the big chase with Draco’s soldiers and the horny Hestian Virgins. I think this was a really interesting idea let down by a script that needed to be thought out a little more. In a nutshell, Xena and Gabrielle wind up in a strange land and meet Aiden, a guru. As Gabby confronts the demons of her past through yoga, she is able to find inner peace. Of course, as we later learn, this man is evil and trying to feed off her goodness (no surprise). Meanwhile, Xena grows increasingly disheveled and violent, as the mythical land exposes each person’s inner being. The point of the episode? According to writer Chris Manheim in the Ninth Edition of The Chakram, the Official Xena Fan Club’s Newsletter, “…Good cannot exist in the absence of evil. The reason someone can be leached of their goodness is because there’s no evil… to balance it.” Although Gabrielle says something directly similar in the episode, the script fails to make the idea as clear as it should be. Essentially, Gabrielle had so little evil in her, that when it was taken away, Aiden was able to feed off her pure soul. 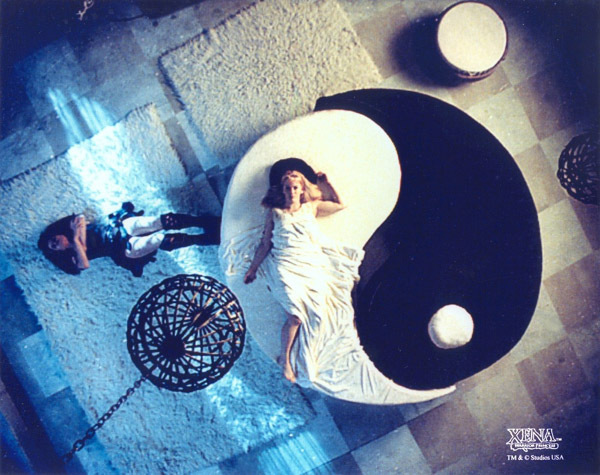 In contrast, Xena was able to survive BECAUSE her darkness existed. A visually stunning episode with ideas that get us about 85% of the necessary way, my favorite moment is the intercutting of Xena’s nosebleed with her violent vision of personally crucifying Gabrielle. Come back next Thursday for numbers 46-50! And check back tomorrow for another Film Friday post! Pingback: THE XENA SCROLLS: An Opinionated Episode Guide (119 & 120) | THAT'S ENTERTAINMENT! Pingback: THE XENA SCROLLS: An Opinionated Episode Guide (221 & 222) | THAT'S ENTERTAINMENT!